Pai Gow Poker is a gambling game found in casino blackjack pits. It is based upon Pai Gow, an Asian game played with special tiles. Pai Gow poker replaces the tiles with Western playing cards and uses poker hands instead of traditional Pai Gow hands to determine the winner. Pai Gow Poker is played with a dealer, representing the house, playing against up to six players. The object of Pai Gow Poker is to divide the seven cards given to you into two poker hands that are capable of beating the dealer’s hands. Pai Gow Poker is played with a 53-card deck (the standard deck plus one joker). 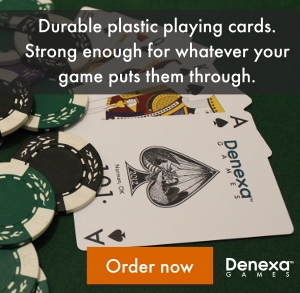 Like all casino table games, Pai Gow Poker is generally played with paper cards, but there’s no reason you can’t use a fresh deck of Denexa 100% Plastic Playing Cards. You will also need chips for each player to bet with, as well as three standard six-sided dice. For a more authentic experience, you can obtain a Pai Gow Poker layout, which is a felt cloth with spaces printed onto it for each player’s bet and their two hands. Players place their bets in the designated space on the layout (or in front of them, if no layout is available). Deal seven hands of seven cards in the middle of the table (not to any individual player), setting the remaining four cards aside. The dealer selects one player to roll the dice. If the outcome of the dice roll is 1, 8, or 15, the first hand goes to the dealer, if it is 2, 9, or 16, the first hand goes to the player at position 2 (immediately to the dealer’s right), if it is 3, 10, or 17, the first hand goes to position 3 (to the right of position 2), and so on. Thereafter, the hands are given out in counter-clockwise order from the position that the first hand was given to. Any vacant seats are still given cards, but these cards are collected before game play begins. 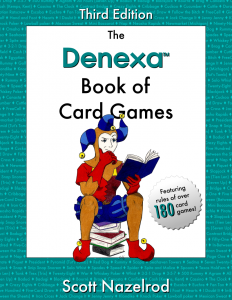 Each player looks at their hand and splits it into two hands, the front hand, which is composed of two cards, and the back hand, which uses the other two cards. The back hand must rank higher than the front hand (which, of course, can only contain a pair at most). The joker, which is known as the bug, is wild for completing straights and flushes in the back hand; in all other circumstances, it is considered an ace. 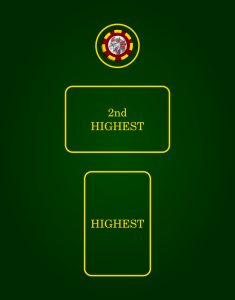 Once the player has determined how the hands should be split, the players set the hands by placing them face-down on the table; the back hand is placed vertically nearest the player, and the front hand is placed horizontally nearest the dealer. (If a layout is being used, the cards are placed in the appropriate boxes on the layout.) Once the hands have been set, the player may not touch their cards again. The dealer then exposes their hand and sets their hands according to a set of rules called the house way. Each player’s hands are then compared to the dealer’s hands. If both of the player’s hands beat the dealer’s, the player is paid out at even money. If they both lose, the stake is lost. If one hand beats the dealer, but the other does not, it is a push. If a player is found to have made the front hand higher than the back hand, the hand is considered to be fouled and the stake is lost. Pai Gow Poker can be easily adapted to home play. All players ante, then seven cards are dealt to each player. Each player sets their hand, keeping it secret from the other players. After all hands have been set, they are revealed. If one player has the highest front hand and back hand, then they collect the lot. If the highest front and back hand are split between two players, the pot remains uncollected, the other players (other than the two winners) ante again, and a new hand is dealt, with the pot steadily building until someone can take it all.